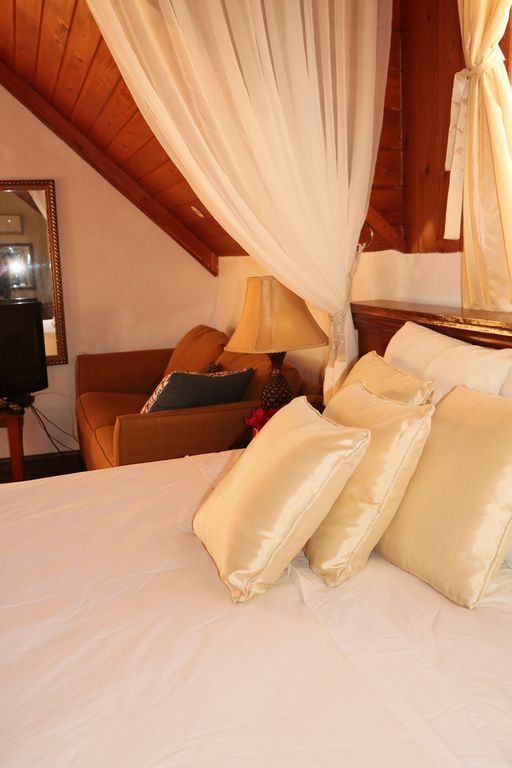 The suite is situated on the top floor of a Victorian style villa on historic Cupid's Cay in Governor's Harbour, Eleuthera. Suncrest House is engulfed in the beauty of the Bahamian seas, from all sides. The western side has the deck which overlooks the rocky crag that meets the astounding azure waters of the Exuma Sound. The eastern window displays, the lively dock side where the mail boats come in, which extends onto a half mile white sand beach that houses the fisherman’s wharf near town center. A few native families still reside on Cupid’s Cay and located all in a 1 minute walking distance are a few restaurants, a pub, a convenience store and 2 churches. Governor's Harbour is a beautiful harbourside town that has earned the title of being a calm and peaceful settlement. The 110-year-old Haynes library is situated in Governor's Harbour, along with century old churches. The Haynes Library Beach, and The Fish Fry Beach - where a local fest every Friday - both border the causeway to Cupids Cay and is a 2-minute walk from Suncrest house. After exploring Cupid’s Cay and Governor’s Harbour on foot, you would want a vehicle for exploring the 100-mile-long island, its mystical caves, bottomless ocean holes, and it’s abundance of endless beaches that are nestled in Eleuthera. Note: Our location on the map is not accurate, so we have uploaded a picture of the correct location. toilet, shower, separate shower and a toilet vanity basin section. Toaster oven for baking etc. small kitchenette area in room with refrigerator, skillet, teapot, toaster oven, microwave etc. Such a glorious week in paradise! Thank you, Theresa for welcoming us to your beautiful island, and to Latoya for such a yummy breakfast and good conversation! Also thank you to Andrew for picking us up in North Eleuthera and for the historical perspective. The beaches, snorkeling, sunsets, and many restaurants - all were fabulous! Theresa, I will wear my brooch with such fond memories. We look forward to our return, and Theresa we look forward to welcoming you to New England! Can’t wait for you to add those burgers! Ohhh wow you guys were so awesome. I enjoyed your friendly spirit. I will definitely visit Rhode Island soon and work on the burger ads. Thanks again for visiting our island. 5 stars for Theresa, and her family, all of whom helped us enjoy our visit to Eleuthera; 4 stars for the accommodation which was lovely and complete with what you need but strange light controls all from the bathroom (renovated dark room! );, and 3 stars for location which is at a working dock. We returned to the Northeast a week ago after a truly relaxing 7 days in the Bahamas, based in Governors Harbour at 'Theresa's Place' (it is on the map as such!). During our stay we ventured well south on the island of Eleuthera, and north to both Spanish Wells and Harbour Island which are reached by short water taxi rides and so worth it. Governors Harbour is a very pretty and historical small town and Suncrest House is located on the tip of the scorpion tail (known as Cupid's Cay) that forms the harbour. We had water views on three sides and unobstructed magnificent sunsets. The location may not be as upscale as many on Harbour Island but the natural unpretentious charm very quickly grew on us and all necessities were just minutes away, including some of the most beautiful and virtually private beaches you will find anywhere. The general store is a time warp in itself stocking anything you could ever think of needing. Local restaurants such as The Buccaneer Club and Tippy's are a short drive from 'home.' The latter is located right above the beach and both atmosphere and the food are great. '1648' is also very good for a more sophisticated change and Da Perk is excellent for breakfast; go for the raspberry and white chocolate scones!!! The house is cute, well equipped and very clean and suited us perfectly. Right next door the owner of Suncrest has a small cafe and a tiny gift shop that is stuffed with an amazing selection of quality 'souvenirs.' The jewel in the crown of our experience was in fact Theresa herself. She knows everyone, her advice was invaluable, and we so enjoyed just shooting the breeze with her. Theresa epitomizes all that is so wonderful about the Bahamas, cheerful, friendly and down to earth. Long may our more than 40 years love affair with this Island nation continue. Great house in the perfect location for exploring the island. We were able to see the north and the south without a long drive to get back home. The harbor has great restaurants and plenty of things to do. The fish fry is a must. Very clean, and the kitchen was well stocked for preparing meals. Wonderful space in a convenient location. The house itself is clean and comfortable and updated. It is a great central location for short trips to the beach or nearby towns, and day trips further north or south. We felt very safe, and Theresa was very friendly and available. This villa is located right on the end of the point in Governor's Harbour. It's clean, well built, and with great views of the ocean on three sides. The bathroom is a bit tight, but the shower is good and roomy. The downstairs is plenty big enough for two people, and I love the upstairs bedroom. The owners are local Bahamians, both very friendly and helpful. They own the small café next door, and live about ten minutes away. The villa is located right next to the port, so if a ship comes in you get to see it unload. We didn't rent a car, so we walked everywhere, including to French Leave beach on the other side of the island. The town is quaint, the locals very friendly and helpful, and there are good grocery stores and restaurants. A wonderful, affordable accommodation, and I wouldn't hesitate to return another time. Suncrest house is a brand new ultra modern villa with a luxurious decor and lots of natural wood. From the hard wood floors in the bedroom suite upstairs to the hand made bed from natural wood made on site. The daybed and counter surround is all hand made on site. Right down to the kitchen cabinets are locally constructed of cyprus wood. At Suncrest you are so comfortable inside and out with the deck from the upstairs bedroom and downstairs living room you are tempted to stay in all day and enjoy the sea views. You might go outside and do a barbicue on the stone barbecue built on site by the maintenance man --Laveaux. This villa built by Theresa's husband Andrew and her son in law is your home away from home. You don't want to leave the house but with over 50 beaches to explore you must get out. Starting with two beaches right in close walking distance from the house--about 3 minutes - take some beach wares and relax in the crystal clear aquamarine waters.